Jeffrey Welch's Blog: What is GDV in Dogs and Why Must Dogs With Signs of GDV See a Vet? The post What is GDV in Dogs and Why Must Dogs With Signs of GDV See a Vet? by Jennifer Lesser appeared first on Dogster. Copying over entire articles infringes on copyright laws. You may not be aware of it, but all of these articles were assigned, contracted and paid for, so they aren’t considered public domain. However, we appreciate that you like the article and would love it if you continued sharing just the first paragraph of an article, then linking out to the rest of the piece on Dogster.com. When you’re bloated after a big meal, a few glasses of water (and maybe a nap) is usually all you need. But bloat in dogs can turn into a deadly condition, known as gastric dilatation-volvulus or GDV in dogs. What is GDV in dogs? GDV might be fatal to dogs — so know the signs. Photography ©fotoedu | Thinkstock. Most commonly referred to as bloat, GDV in dogs is a rapidly-progressing gastrointestinal condition that can be fatal to your dog. “It’s a condition in which the stomach flips upon itself and then distends with fluid and gas,” explains Dr. John Gicking, DVM, a board-certified emergency and critical care veterinarian with BluePearl Veterinary Partners. “It then causes dogs to go into shock, and causes a great amount of pain.” Because the stomach swells, the common term for GDV is bloat — but your pet can experience other types of bloat, such as from foreign bodies or undigested food. “GDV is a condition that I’ve nicknamed ‘the jet plane crash of veterinary medicine,’” adds Dr. Marty Goldstein, DVM, author of The Nature of Animal Healing and founder of Nature’s Blend dog food. While Dr. Goldstein notes that GDV is most commonly found in large-breed, deep-chested dogs like the Great Dane, German Shepherd Dog, Greyhound, Standard Poodle and Saint Bernard — and it’s also usually associated with older pets — it’s a condition that can affect dogs of any breed, age and size. According to Dr. Angela Hughes, DVM, PhD, veterinary genetics research manager at Wisdom Health canine genetics company, the most obvious clinical sign of GDV in dogs is retching — when your dog looks like he’s going to vomit, but nothing is coming up. Your pet may also show other signs of abdominal pain, such as appearing anxious and looking back at her stomach, standing and stretching, or drooling or panting. “Finally, after a little bit of time, you may notice that her stomach area looks distended — like she swallowed a basketball,” she explains. However, it may not always be obvious, particularly in larger dogs with more muscle mass because it can hide the enlarged stomach. As the condition progresses, your dog will likely become weak, and she may even collapse and be unable to stand or walk. “Your veterinarian may also note that the dog’s heart rate is increased, her pulse feels weak, and she is breathing more rapidly than normal,” Dr. Hughes adds. Seek immediate treatment the moment you see any warning signs of GDV in dogs. “Oftentimes, these dogs can decline very rapidly … so you may have less than an hour to seek care,” Dr. Hughes warns. “Time is definitely of the essence because the longer the stomach is expanding and the dog’s blood supply is compromised, the more damage is being done to their tissues and the worse the prognosis for survival.” Sadly, Dr. Hughes says reported mortality rates for GDV in dogs range from approximately 15 to 28 percent. A veterinarian will immediately X-ray your pet. GDV in dogs presents with a large, gas-filled stomach that occupies most of your dog’s abdomen. Dr. Goldstein explains that a vet will stabilize your dog with intravenous fluids and sometimes even oxygen, and at the same time, decompress the gas in your dog’s stomach. “If the stomach is twisted, it can be temporarily deflated from the outside of the body by your veterinarian, followed by surgery to untwist it … then it can be tacked down to the abdominal wall to prevent it from happening again,” he adds. 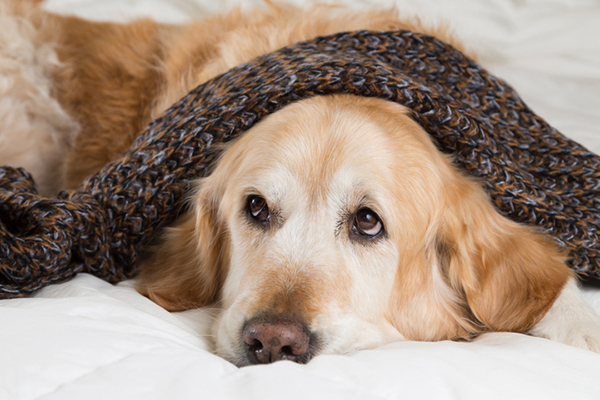 So, how can pet owners prevent GDV in dogs before it happens? While the causes of GDV in dogs are still not completely understood, Dr. Hughes says that consuming a larger meal once a day — as opposed to two or more smaller meals — and eating from an elevated platform seems to increase the risk of developing this condition. “It also doesn’t hurt to slow down their food consumption through the use of feeding aids — like a ‘bloat bowl’ — or training them to eat more slowly,” she says. You may also want to limit your dog’s exercise and water intake for an hour before as well as an hour or two after meals to help reduce the risk. “Stress may also play a role … so trying to lower your dog’s stress levels can help prevent a bloat or GDV event,” Dr. Hughes says.